Hilmi Hammad was 18 years old in 1948 when Israeli forces entered his village. He became one of about 200,000 Palestinian refugees who ended up in the Gaza Strip at the end of the 1948 war. The site where Hilmi's village once stood is located today in the center of Israel, and though Hilmi has spent his life in Gaza, his home is still in that village, to which he hopes to return. In the second episode of Gaza, a series from Unsettled, we hear from Hilmi and his son Isam. Isam was born in Gaza and is one of the organizers of the Great March of Return. Isam and Hilmi shared with us their history and talked to us about what it means to be Palestinian refugees in Gaza, still dreaming of returning to their native village. This episode was produced and edited by Asaf Calderon, with help from Ilana Levinson. Fact-checking by Ilana Levinson and mixing by Max Freedman. Music by El Far3i and from Blue Dot Sessions. Unsettled theme music by Nat Rosenzweig. Artwork for our Gaza series by Marguerite Dabaie. Isam Hammad is an engineer, graduate from Waterford Institute of Technology, wishing to see the world living in peace and free from hatred and wars. My dream is to return back to Sarafand, the little town we were displaced from by the act of war in 1948. Hilmi Hammad was born in 1930 in Sarafand al-Amar, Palestine. Graduate of Haifa Vocational School. In 1948, he arrived to the Gaza Strip as a refugee. He started working with UNRWA Vocational Training Center in Gaza as a lathing instructor in 1952. In 1963 he became the institution’s director, and retired in 1990. He was one of the founders of the Islamic University of Gaza, and the Patients’ Friends Benevolent Society. Leena Dallasheh is an assistant professor of history at Humboldt State University. She received her PhD in the joint History and Middle Eastern and Islamic Studies program at NYU. Her work focuses on the social and political history of Nazareth from 1940 to 1966, tracing how Palestinians who remained in Israel in 1948 negotiated their incorporation in the state, affirming their rights as citizens and their identity as Palestinian. She has published serval articles and book chapters, including “Troubled Waters: Governing Water and Struggling for Citizenship in Nazareth,” which appeared in IJMES 47 (2015). Before coming to NYU, she received a law degree from the Hebrew University in Jerusalem. Zochrot, an Israeli organization dedicated to remembering the Nakba and promoting the right of return. Check out their website for more testimonies from the Nakba, a map of pre-Nakba Palestine, and for thoughts and practical ideas about return. Nakba Archive, a website that features testimonies of Nakba survivors. The testimony of Yerachmiel Kahanovich, an Israeli soldier who participated in the occupation of Lydda and claims he had fired an anti-tank rocket into the Dahmash mosque. The testimony of Binyamin Eshet, another Israeli soldier, who reported that Palestinian civilians were made to bury the victims of the massacre in the Dahmash mosque, and then they were killed themselves. Women’s testimonies of the Nakba. Jonathan Cook, Dylan Collins & Ezz Zanoun, “Nakba survivors share their stories of loss and hope”. Al Jazeera, 19 May 2016. Tom Pessah, “Yes, the right of return is feasible. Here is how”, +972, November 7, 2017. El Far3i, Palestinian songwriter, percussionist and vocalist based in Amman, Jordan. ASAF CALDERON: 1948. It’s a year I remember hearing about from a very young age. Growing up in Tel Aviv, 1948 was celebrated as the year in which we declared our independence, were attacked by the Arabs, and won the war despite all odds. On Yom Ha’atzmaut, the Israeli independence day, My family used to hang the Israeli flag on our balcony, watch the fireworks and the kids would spray each other with silly string in Rabin Square. Like other nations, we were taught to cherish our independence, but unlike other nations, ours was in the making for the past 2,000 years. For us, 1948 was a celebration of a people coming home. For Palestinians, 1948 means something entirely different. It’s the year that marks their expulsion from their homeland, when hundreds of thousands of Palestinians became refugees, in an event they call the “Nakba” - which means “catastrophe” in Arabic. Our episode today focuses on those Palestinian refugees who ended up in the Gaza Strip. Of the the approximately 1.9 million people who live in the Gaza strip today, about 1.4 million are refugees. The places that these refugees come from are places that you may think of today as integral parts of Israel like Ashdod or Be’er Sheva, or even the neighborhood where I grew up in Tel Aviv. How did they end up in Gaza, and why? And what does it mean to be a Palestinian refugee in Gaza and still dreaming of returning to your native village? I’m Asaf Calderon, and you’re listening to Gaza: a series from Unsettled. ASAF: Before we continue, a word of caution: this episode includes descriptions of violence. ISAM HAMMAD: Our aim is to return, regardless of who’s governing the area. Our main issue is the land. We want to return to the land. ASAF: This is Isam Hammad. 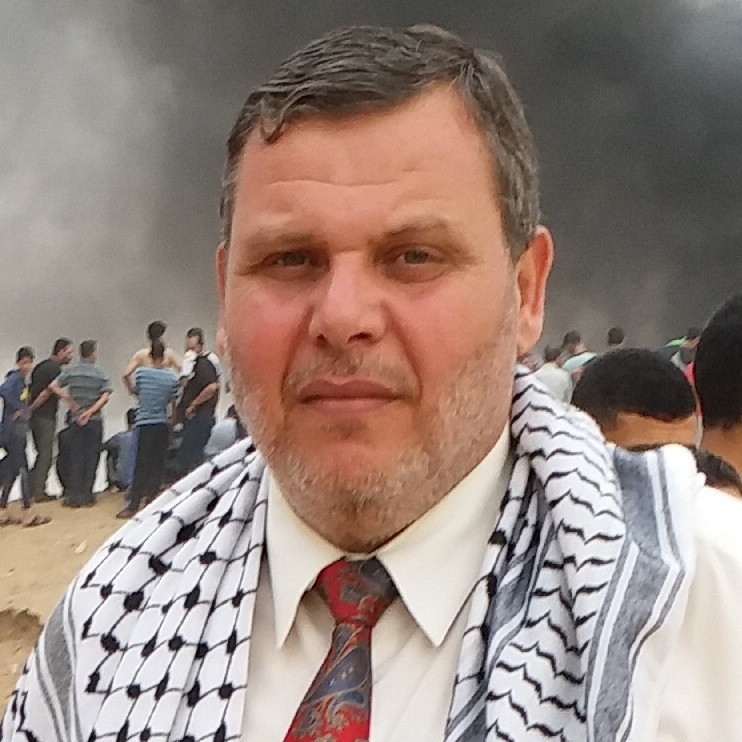 In the first episode of our Gaza series, you heard from Isam about his role in organizing the historic Great March of Return. For Isam, that land he’s talking about is not an abstract idea, but a specific place. He was born in Gaza, but his parents were born in pre-1948 Palestine. In this episode, you’ll hear from Isam and from his father, Hilmi, who is 88 years old. HILMI HAMMAD: I was born in 1930 in Sarafand village, Ramle district, Palestine. ISAM: And I was born in Gaza in 1965. ASAF: Sarafand Al Amar was a village located in the lowlands at the heart of Palestine. in 1948, it had a population of about 2,200. Sarafand hasn’t existed since the 1948 war. But to Hilmi and Issam, it’s home. HILMI: It is impossible to forget your birth place. Impossible. ISAM: I always sit with my father and he tells me about Sarafand and how my grandfather was living and he was the Mukhtar of the village, the head of the village. So we were an important family in Sarafand. I used to listen to the old men of Sarafand and listen to the stories how the life was, how beautiful the life was in Sarafand. HILMI: It was a very clean village. Mostly red tiles covers the houses. And the streets are quite wide enough for any car to pass in. and most of the people used to own land and to cultivate oranges and other vegetables. We had a boys school established in 1921 and a school for girls established in 1947. It was a village that can depend on itself. ASAF: Growing up in Israel, I was taught that before we came, Palestine was basically empty: a land without people for a people without land. If you asked me about 10 years ago, I’d tell you that before Zionism, Palestine was a basically a desert, and that the Palestinians just didn’t really know how to use it. LEENA DALLASHEH: Well Palestinian society was by and large an agricultural society until the expanding incursion of the British, and along with of course the continuing land dispossession by the the Zionist movement. ASAF: That's Palestinian historian, Dr. Leena Dallasheh. You may remember her from our Jerusalem series in 2017. You'll be hearing from her throughout this episode to debunk some myths and give us some background. LEENA: Palestinians according to reports from the 1930s were basically working every cultivatable part of the country at that time. HILMI: it was a good and busy village, we had orange orchards, we had land cultivate oranges and cultivate vegetables. ASAF: Throughout our conversation, Hilmi kept referencing these oranges. HILMI: I didn’t tell you the area of the orange orchard. It was 110 dunams. 110 dunams. ASAF: It was important for him that you know the exact area: 110 dunams, equal to 27 acres of orange groves. LEENA: The citrus industry was becoming more and more significant in the coastal plain. It was directed at international export and as such it actually offered a promise of a profit that made it into an important financial venue. HILMI: Also one of the things that our village enjoys was that it falls on the Jaffa-Jerusalem road. So the main transport from Jaffa to Jerusalem, and from Jaffa to Lydda and to Ramle, used to come through the village. Also we were about seven kilometers far from Lydda airport, the main airport in Palestine. So the area we used to live in, it was a busy area. We can say that it was a village that is good for living in. ASAF: Lydda, known in Arabic as Al-Lydd, was the nearest large town and a major transportation hub. It still is today, though it’s known as Lod, it’s Hebrew name, and most of its residents are now Jewish. The airport is still there, and we now call it Ben Gurion Airport. ASAF: This is David Ben Gurion himself, the first prime minister of Israel, as he declares Israel’s independence on May 14 1948. His declaration was based on a the UN partition plan approved in November 1947. This plan would have divided Palestine between a Jewish state and an Arab state - except for Jerusalem, which would have been under a special international regime. In the Israeli narrative, the fact that the Jewish leadership accepted the deal while the Palestinians rejected it, is often used to justify the fact that Israel eventually expanded much further than the plan intended. But the Palestinian leadership wasn’t an elected body, and anyway, the plan didn’t reflect the demographic reality in Palestine. LEENA: When the partition plan was issued the Jewish state received about 56 percent of the land and the Palestinians about 43. Within the Jewish state almost 45 percent of the population was Palestinian. So it was a very significant - whereas in the Palestinian state there was a very very small Jewish minority, almost insignificant in terms of scale. ASAF: Though Jews were only about a third of the population, the Jewish state was supposed to control over half the land, including land where Palestinians were living. This is the deal that was rejected by the Palestinian leadership. The approval of the deal by the UN General Assembly immediately led to a civil war between Palestinian and Jewish militias. Then, when the British finally left on May 14, 1948, Israel declared its independence, and as a result, the neighboring Arab countries joined the war on the Palestinian side. HILMI: When I left Sarafand I was 18 years old. We were forced to leave, because in… because you know on the 15th of May 1948 the Arab armies entered Palestine to liberate it, as they say. ASAF: But none of the Arab armies came to defend Sarafand and its residents. Sarafand was close to a British army base which was handed over to the local Palestinian forces when the British left. But these forces alone were not enough to defend it. HILMI: So the Israelis occupied it by force on the 20th of May. They bombed the village. We sent the family, the ladies, and the children to the orange orchard because it was very near to Lydda. You see? And we kept in the village until heavy bombing started again. We left to take the ladies and the children to Lydda. I felt sad. I felt sad and I mean - I couldn’t stay in the village. I felt sad but I was forced to leave. I was exactly forced to leave it. If I stay, I will be killed. And when I am killed the children will be sent to the orchard with the ladies, nobody will protect, stay with them. They need help. So we stayed in Lydda for quite a while until July. HILMI: But they had no ammunition after 2,3 days they had no ammunition. The Israelis used to bomb the two towns by airplanes, so they occupied Lydda and Ramle and pushed the people. They committed two massacres, one in Lydda at a mosque called Dahamesh mosque. They brought the people into Dahamesh mosque and they. killed them. In addition to that they passed the streets in Lydda and Ramle killing the people on the two sides. ASAF: They didn’t teach us about this in school. I am 28 years old and I never heard about these massacres before Hilmi told me about them this fall. The Israeli forces occupied Lydda on July 11, after a day of bombing and raiding. They soon faced resistance from the local people, who fired at the soldiers from inside buildings. According to Israeli historian Benny Morris, the soldiers were ordered to suppress the resistance with “utmost severity.” After they instituted a curfew, civilians who rushed into the streets attempting to escape were shot on sight. Some soldiers threw grenades into buildings where they suspected sniper fire was coming from. At some point that day, Israeli forces opened fire on the Dahamesh mosque. Like just about every event of the Nakba, there are multiple accounts of exactly what happened there. But according to the recently published testimonies of Israeli soldiers who were there, Palestinian civilians were hiding in the mosque, possibly because they thought Israel would not attack a holy place. One of these soldiers admitted that he fired an anti-tank rocket into the mosque, killing everyone inside. The number of casualties is still unclear. After the massacre, came the expulsion. When asked what to do with the Arabs of Lydda, Ben Gurion simply raised his hand, and pointed east. HILMI: So they ordered the people to leave, to King Abdullah - they mean to Jordan. So the people started walking, it was at that time summer time and 8 of Ramadan, the people were fasting and they were pushed. Took about 8 to 12 kilometers. under the hot sun, with old people dying on the street and they, their sons couldn’t stop to give them any help, just only to pray Al Fatiha for them and put a stone under their head and leave. ASAF: Between 30 and 70 thousand people, most of the population of Lydda and Ramle as well many people recently displaced from other villages in the area, were then expelled to the Jordanian-occupied West Bank. Among them were Hilmi and his family. LEENA: Al-Lydd is actually a classic example of the systematic intended depopulation of the Palestinians. The Israeli army basically commits a massacre within the mosque and then forces the population thousands and thousands of people in July in the heat of July in Palestine to march in a very very clear instruction they're guarded by armed soldiers with no water or food. Men women and children elderly sick they're all forced to march, in a march that resonates with the Trail of Tears. Which I think is very important to kind of keep in mind or to bring especially to an American audience. This is an image that we are not exposed to. We don’t hear that story. But Palestinians were forced out of their homes, sometimes put on trucks, but in this case, this was one of the starkest cases in which they were literally forced to march, leaving the city with a very very small number of Palestinian population which was then gathered all and put in one area of al-Lydd which then was called the Ghetto by the Israelis. ASAF: After Hilmi and so many others were marched to the West Bank, only about a thousand people remained in Lydda, concentrated and confined in the area that the Israelis called the Ghetto. They were eventually released from the Ghetto but by then, their houses were already taken. Jews were now living in them. HILMI: We ourselves went to Birzeit and stayed at Birzeit for about four months then we didn’t like to stay more than that. Because people said that the Jordanian army cannot protect people in Birzeit, so the Jews will come later and occupy it. People were saying and making stories that the Egyptian army is strong enough to fight and to protect people and so on. ASAF: The Egyptian army at the time was in control of the Gaza Strip. HILMI: We came to the Gaza Strip and then the road between the West Bank and the Gaza Strip was cut, so we stayed in Gaza Strip. ASAF: Hilmi was one of approximately 200,000 Palestinian refugees to end up in the Gaza Strip when the war ended in 1949. All in all, the UN estimated there were 726,000 Palestinian refugees. At the beginning of the war, the population of the Gaza strip was only about 60-80,000 people. I asked Leena what the Gaza strip was like before the influx of refugees. LEENA: It wasn't the Gaza Strip. For one. You know we are so our imagination is so used to this being the strip right. LEENA: Ashkelon - or what is now Ashkelon, Majdal - was right there. It was a continuation. It was a flourishing port city. It had very strong connections some of its leaders were among the leaders of the national movement. It was a city in many ways similar to other Mediterranean cities. It definitely was not this crowded. And it was also not only a city. What we think about as Gaza Strip now, we we automatically tend to think about it as one place. It was actually several places that now because of the density of the population have turned into one thing but Deir al-Balah was an absolutely different place. ASAF: Though the newly formed Gaza Strip was under the control of Egypt, the Palestinians - both locals and refugees - did not receive Egyptian citizenship. Other than Jordan, none of the major host countries absorbed the refugees. LEENA: I mean you have all these refugees and nothing for them no resources for them. Whereas in terms of discourse the Egyptian state championed the Palestinians and their cause and the Palestinian refugees, in practice there was not much done for them. ASAF: The Palestinian refugees became dependent on the UN, who created a new agency for them, separate from the United Nations High Commissioner for Refugees which deals with the rest of the world’s refugees. LEENA: Once the war settles and the U.N. realizes the magnitude of the Palestinian refugee problem, they create UNRWA, which is the U.N. agency specifically directed to handle the Palestinian refugees. It was created as a temporary solution to deal with the hundreds of thousands of refugees that are out there with no food or work or shelter. And the temporary became semi-permanent and 70 years later UNRWA still has to deal with the refugee camps because again the host states continue to not accept and not incorporate refugees within their responsibility and with the services and documentation and aid and - I mean UNRWA provides schools and health care and food and jobs for Palestinian refugees. ASAF: In Gaza, most of the refugees settled in 8 makeshift refugee camps that were established across the strip. LEENA: Even then there was already an overcrowdedness for the space which only escalated with time. And if you look at refugee camps if you see footage of refugee camps you'll see that the structures were clearly built as temporary. No one thought this place is going to expand and expand to become like this. And that's why it looks like a jungle because it was never intended to be a house for all that many people. ASAF: Hilmi’s family had the resources to rent an apartment in Khan Younis, which is a town in the south of the strip, so he never had to live in one of these refugee camps. He found a job working as a mechanic for the Egyptian army, and after a few years he started teaching at an UNRWA vocational training center in Gaza City. Though he never stopped thinking about Sarafand as his home, he made a life for himself in Gaza. He eventually rose to become the principle of the training institute. He also married Nada el Attar, another refugee from Sarafand. And in 1965, their son Isam was born. ISAM: Maybe I was one of the fortunate boys in Gaza who live in the center of the town, the life of ours was a little bit different, or too much different than the life of my friends who lived in the refugee camps between the small homes and narrow streets and lack of services in the refugee camps and the harsh life actually in the refugee camps, so probably I was one of the fortunate people. ASAF: But if it seemed like life was settling down for the Hammad family, everything would change once more in 1967. ISAM: The first memory, I still remember it, in 1967 when the Israeli army came into our house I still see it, when I remember a scene actually. The Israeli soldiers attacking our home and entering to search for arms and for people in our home. This is my first memory which I still remember it until today. Two years I was. HILMI: They call it 6 day war but I don’t think it was more than 6 hours war. ASAF: The Gaza Strip was occupied by Israel along with the West Bank and parts of Egypt and Syria. HILMI: You know, because the Israelis won the war, they did no borders between Gaza Strip and Israel. People used to go without purpose without anything and they used to have work there. Many people got the job there. ASAF: It’s hard to imagine today, but Starting in 1972, the Israeli military allowed relatively easy movement in and out of Gaza. As the occupied territories became incorporated into the Israeli economy, Palestinians from the West Bank and Gaza started providing cheap labor for Israeli farms, construction sites and restaurants. And for the refugees, the 1967 occupation provided an opportunity to return to their homes - as visitors only. HILMI: I went and visited our orange orchards, and went to visit the village. It was demolished except the school and very small places only. Houses. ASAF: The orange orchards were still there, and Hilmi met the Jewish man who was now cultivating them. HILMI: He was Iraqi, speaking Arabic. We told him we hope that by now very much money is kept for us because you are selling oranges every year and keeping the money. ASAF: The man laughed, and asked Hilmi if he will pay for the losses. ISAM: So I visited Sarafand so many times, I do remember it very well. On our land there’s a big military base now, and some other establishments for the army. ASAF: Today, most of Sarafand lies under an Israeli army base called Tzrifin, which is an expansion of the old British base that was occupied in 1948. Other parts of the land are under the jurisdiction of different Israeli municipalities, and some are still cultivated. Starting with the first Palestinian Intifada or uprising in 1987, Gazans’ access to 1948 Palestine became more restricted, and visiting became much harder. The greatest change, however, happened in 2005, when Israel retreated from the Gaza strip and evacuated its settlements there. In 2007 Hamas took control of Gaza, and Israel began a siege, which has continued until today. Gaza became completely isolated. And over the years, its population kept growing. ISAM: From misery to more misery. The simple reason - this is the reason: when the people were moved to refugee camps they were number, they very few. But now these people are one million 300,000 living in the same area. So inside the camps it is misery. it is absolute misery. HILMI: You know because the area of the camp is limited and you cannot add to to any centimeter. ASAF: The Gaza Strip is already one of the most crowded places in the world, and the UN foresees an increase of another 1.3 million people by 2030. Gaza was already declared unlivable by the UN, so there is no doubt in anyone’s mind that this situation is completely unsustainable. Israel has no real solution to this. But the solution that Hilmi and Isam call for is return. For over 70 years, The right of return has been a hope and a yearning for Palestinian refugees- a deeply held belief in a future of liberation in their ancestral homeland. Israel refuses to grant Palestinian refugees this right, and at the same time it allows Jews from all over the world to immigrate relatively easily under the so called “law of return” - the return of the Jews to their promised land. LEENA: Israel is invested in this idea of a Jewish state. And in order to maintain this idea there is a need for maintaining a Jewish majority. If the Palestinians were granted the right of return the Palestinians will soon become a majority between the river and the sea. And that is a scenario that Israel is not willing to contemplate. Any threat to a clear Jewish majority in the country is is what is rejected and has been rejected by Israel for generations. ASAF: Even Zionists who oppose the occupation often oppose the right of return, because it will almost certainly shift the demographic balance back to a Palestinian majority. Another concern that is often raised is space: there’s just no room for all of the refugees to return. Right? ASAF: The majority of the lands of abandoned Palestinian villages are not currently populated by Israelis, but are used as farmland or nature reserves. Sarafand is today mostly an army base, which can be moved relatively easily. A lot of work has been done on the feasibility of return, and we will link to some of this research on our website. But regardless of how we might feel about the idea of return, the refugees of Gaza continue to show up every Friday to demand it - in the Great Return March, which we talked about in the last episode. I asked Isam and Hilmi what return means to them. HILMI: it means that we have to have our land back again. We cannot leave just like that because they occupied it. They took land with town, villages, roads, airports, railway stations - free of charge, they took it. They paid nothing for that. It’s impossible to accept that. We cannot accept that. We have to return back to our country. I myself, I expect that time will come that we return back to our home country. ISAM: The right of return for me means that we move from death to life, I regain my identity and I start building my future and my children’s future in the land of theirs, the land that they own. The land that they belong to. The place that they must be. Here I am always a visitor and a person who is waiting to return back to his own place. It is our land by paper, by law, United Nations Resolutions, by history, by our narrative and by facts. And as my father said, I am in the younger generation waiting for the moment to go back to our land. ASAF: Israel has always opposed the right of return, but in recent decades, a new argument became common, stating that even if refugees like Hilmi have the right of return, this right doesn’t extend to their children who were born in exile. LEENA: The right of return is an individual right. So basically the only people who have the right to waive it are the Palestinians are the refugees themselves the individual refugees. So no one else theoretically if you were going to think about the legal rights no one else has the right to tell you that you will no longer have a right. LEENA: So I don't understand why one would assume that there is some kind of you know what you call it that the passage of time would would nullify this this right. And if the parents didn't get the right of return so then why do their kids not enjoy it. ISAM: When you ask me what does Sarafand mean to you or the right of return, I said to you I want to move from death to life. Why is that? Now, we are living in uncertainty. Now, we don’t know whether our children will finish this year’s school or not. Now… it is… you… we must live in uncertainty. We don’t know whether the borders are going to open. We don’t know if our needs are going to be fulfilled. We don’t know if we are going to live tomorrow or not because every day we are threatened with war from Israel. This is living in uncertainty is disaster. This is the problem of Gaza: loss of hope loss of… loss of life, completely. You cannot plan to your life at all. You know every Friday I go to the return camps here in Gaza to the Great Return March. I tell you that my children are keen to go with me every week. And I am teaching them as my father taught me. He taught me how to love Sarafand. How I have to understand how important Sarafand is to us. I always teach my children how Sarafand is important to them. And I plant in them the love of Sarafand and anxiousness to the day they return back to Sarafand. Home means, to me, the place you don’t fear dying away from. As simple as that. HILMI: My home? Sarafand. Sarafand al Amar. I never forget it. Never ever forget it. ASAF: For me, home is Tel Aviv. Though some neighborhoods existed before the Nakba, Tel Aviv greatly expanded after it, on the ruins of Palestinian neighborhoods, villages and orchards. I grew up among remnants of these places, and didn’t even see them. Only once I learned about what happened in 1948 I began to notice: a ruined stone house, a broken arch, an ancient grove of trees. They were hiding in plain sight, but once I started seeing them I couldn’t unsee them. The Israeli narrative teaches us that if the Palestinian refugees return to their home, it will no longer be our home. Most Israelis think of the return of the refugees as a doomsday scenario. But it’s not so hard to imagine Jews and Palestinians living as neighbors: it’s already happening in cities like Yafa, Haifa and even Lydda. What’s harder is to imagine is what life would be like if Jews were no longer in the demographic majority. But that is really a question about legal structures and governance and policy - and this is not that kind of episode. The least we can do, before we get into all of that stuff, the very first step towards a just future for Palestinians and Jews, is to see what’s always been right in front of us. This episode is dedicated to Nada Hammed, Hilmi’s wife and Isam’s mother, who passed away in 2015 in Gaza, away from her home village, Sarafand Al Amar. Unsettled is produced by Ilana Levinson, Emily Bell, Max Freedman, and me, Asaf Calderon. This episode was produced and edited by me, with help from Ilana Levinson. Fact-checking by Ilana Levinson and mixing by Max freedman. The song you’re hearing now is called “Madineh Haditheh,” by Palestinian artist El Far3i. You can check out more of his music linked on our website. Other music you heard in this episode is from Blue Dot Sessions. Our theme music is by Nat Rosenzweig. Original art for our Gaza series by Marguerite Dabaie. In this episode we presented a glimpse into the life of a single family, from one village. There are millions of Palestinian refugee stories, each with its own unique perspective, and there is so much more to be said about the Nakba and about the different Palestinian refugee diasporas. There is also a lot more to discuss about the right of return, and what it implies for the future of Israel Palestine. Check out our website, unsettledpod.com, for testimonies and other resources. Don’t forget to follow Unsettled on Facebook, Twitter, and Instagram and sign up for our e-mail newsletter. And of course - subscribe wherever you get your podcasts, so you never miss an episode of Unsettled. In the next episode, the one subject that hangs over all conversations about Gaza: Hamas. TAREQ BACONI: Saying that Hamas is a terrorist organization doesn't absolve us of the responsibility of understanding what is happening on the ground today. It doesn't absolve us of the responsibility of holding Israel accountable to the illegal ways it deals with the Palestinian people. I think that Hamas has become a very effective fig leaf that allows Israel to legitimate policies that are morally corrupt.